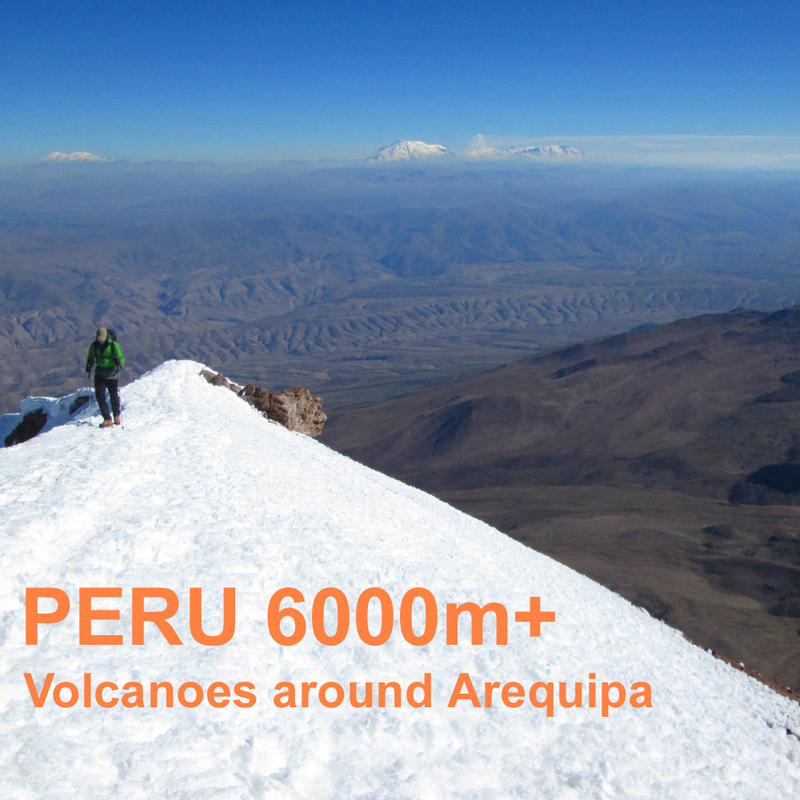 Based out of the city of Arequipa in southern Peru, this expedition will climb two high peaks in this part of Peru. After an initial two nights in Arequipa to acclimatise we will travel to Chivay at a height of 3500m in the Colca canyon for three more nights of acclimatisation. While here we'll visit the famous viewpoint which gives unparalleled views of condors soaring in the early morning sunshine. The two big peaks we plan to climb are Nevado Mismi, 5598m and Nevado Chachani, 6075m. Mismi rises above the south side of the Colca canyon. 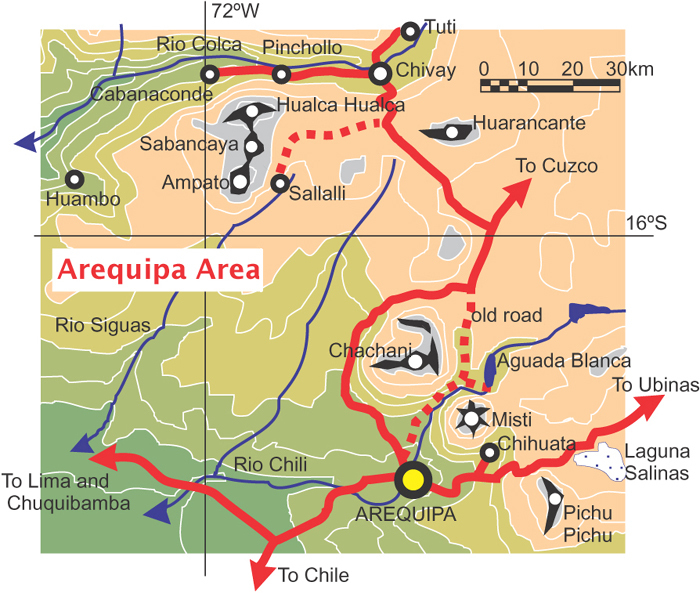 It is a short 4x4 drive from Chivay to a high camp and/or road end. From the road end we'll climb by the north slopes. 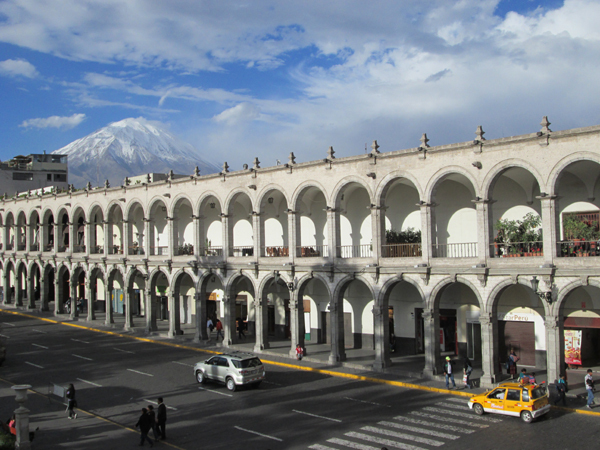 Chachani can be seen from the centre of Arequipa and is a long chain of 4 or 5 major peaks of volcanic origin. We'll be able to drive quite high on the mountain again, ad this makes Chachani one of the easiest 6000m+ peaks in the Andes to climb. On both peaks we are likely to need to use ice-axes and crampons for short sections near the summits. A high standard of fitness is always required for ascents over 5000m, but we don't anticipate this expedition being unduly arduous, as we can approach both peaks to quite high altitudes in a 4x4 vehicle. While previous experience of winter walking or climbing would be useful it is not essential to have this prior to the expedition. However prospective clients must have at least some general mountaineering, mountain walking, or high altitude trekking experience. Days 1-2 Flight via Lima to Arequipa. Day 3 Day in Arequipa for acclimatisation. Day 4 Travel to Chivay and short walk. Days 5-6 Further acclimatisation walks and easy climbs around Chivay. Days 7-8 Travel to our first high camp and ascent of Mismi, 5598m. Days 9-10 Climb Chachani, 6075m. Day 11 Spare itinerary day to be used as necessary. Days 12-13 Fly home from Arequipa. Please read our warning on altitude before booking this expedition to high altitudes. General information about equipment, accommodation, flights, meals etc. Arequipa is a pleasant and relatively prosperous city in southern Peru, and the nearest place to the mountains that we can fly to. Surrounded by the Atacama desert, it sits in an oasis at 2300m at the foot of the active volcano El Misti. There is a particularly beautiful old colonial area centred on the Plaza de Armas, with the 5800m high Volcan Misti forming a stunning backdrop. Our usual hotel is located right on the corner of this plaza. There are some interesting museums, architecture and a large cathedral, for those who like their tourist sights, and some good cafes and restaurants for those who like their food. The wee town of Chivay is located at an altitude of 3500m by the Rio Colca, and is about a ½ day drive from Arequipa. We will spend two acclimatisation days and three nights in Chivay before heading to the mountains There is some beautiful pastoral scenery in the area, which is much less dry than the Arequipa area. The town attracts a fair number of tourists and has a calm laid-back atmosphere. On the main square is a bar that is reputedly the worlds highest Irish pub.! We normally use a quiet hotel in the neighbouring village of Yanque while we are based here. The nearby Colca canyon is a popular tourist destination - it is famously regarded as the deepest canyon in the world and is one of the best places in the Andes to see condors. 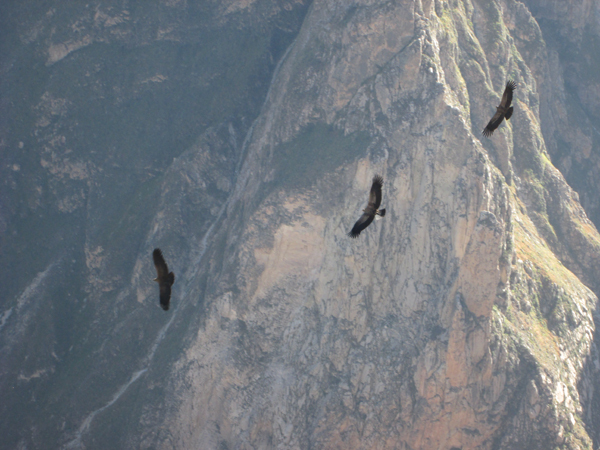 As well as doing a couple of acclimatisation walks at higher altitudes from Chivay we will visit one of the best viewpoints over the canyon where we are 99% certain to see condors soaring. The volcano El Misti (not to be confused with Mismi) seen from the beautiful plaza in Arequipa. Nevado Mismi (a different peak from El Misti) is a high, easy and accessible peak just to the south of the town of Chivay It is about a 2-3 hour drive on a 4x4 track to reach a high camp at about 4800-5000m. From this camp, the next day, we'll climb to the summit by the north slopes in a reasonably short day (for such high altitudes!). The ascent of Mismi will be over scree, boulders, and probably some small snowfields. The summit has great views out over the Colca Canyon. A small spring on the north side of the mountain is widely believed to be the furthest source of the river Amazon and we may have time to visit this. Approaching the summit of Nevado Mismi, at 5400m, 2017 ANDES expedition. Nevado Chachani is a 6075m high peak nearer to the city of Arequipa. Before heading to this peak after climbing Mismi we will have an overnight hotel stay back in Yanque or Chivay to rest and shower. The next day, after an exciting 4x4 approach to a parking area at just over 5000m we'll walk a short way through a lava flow to an advanced camp at 5200m. From here Chachani is basically a long days walk on reasonably good paths, normally with an early (dark) start. The steep ascent is largely over zigzag paths on scree and rock but an ice-axe and crampons are normally necessary for the final snowfields above about 5700m. 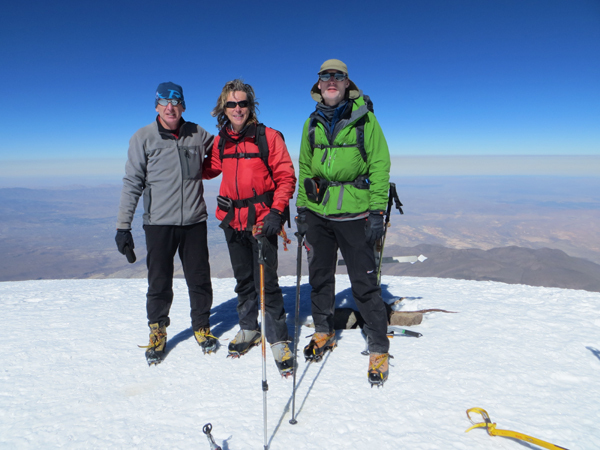 On the summit of Chachani, June 2015 ANDES trip. This time of year is the end of the dry season in the Peruvian Andes and there are long periods of stable weather with fewer storms than there are in the Alps in a normal summer. There are sometimes windy days at altitude and occasionally light afternoon snow flurries, but really bad weather is unlikely. Temperatures at altitude are extremely cold, going down to -10ºC during the 11 hours of darkness each night, so bring a warm sleeping bag and a good book for the camps! Ascents to over 6000m require considerable fitness. Good hillwalking/mountaineering fitness and stamina is important, but for high altitude expeditions clients also need good cardiopulmonary (heart and lung) fitness. This can only be maintained by a program of intensive exercise such as sprinting, squash, circuit training or sprint cycling. This should be done in small doses (e.g. half an hour every other day) over a period of a couple of months prior to your expedition. Without this training you are unlikely to get to the summit. The trip is largely vehicle based, but on Chachani we will need to do a few hours with backpacks to and from our high camp. Cold nights, early starts and freeze-dried food are a few of the other experiences which will have to be enjoyed. Any small snow and ice sections we encounter on this expedition should be very straightforward, so previous experience of winter walking or climbing is not essential. 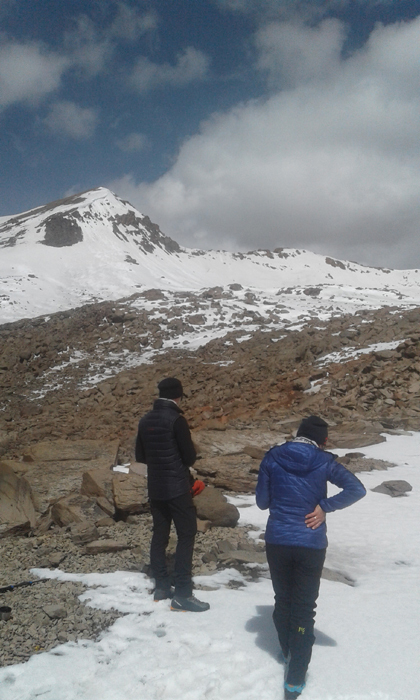 However clients should have good general high mountain or Alpine trekking experience, as you will be walking on rough paths and sometimes untracked terrain at heights well in excess of 5000m. All clients must be insured for medical costs and repatriation in an emergency. We recommend having insurance for baggage, personal liability and cancellation as well. Vaccinations for tetanus, typhoid, polio and hepatitis are needed! Your doctor may also recommend rabies, cholera and diphtheria injections. Malaria and yellow fever precautions are not necessary as we won't be visiting mosquito infested areas. Peru suffers from a reputation for theft, although we have never seen any incidents. It is important to stay alert when in busy public areas and to guard your belongings carefully at all times. Muggings and other violent crime are very rare. We will issue further advice to all clients before departure. Condors at the Colca Canyon, 2015 ANDES expedition. Our expeditions are designed to be small and flexible. The expedition will be co-ordinated, organised and lead by us, but we will consult and involve you when planning the details of the expedition. Please note however that the leaders decision is final where the safety of the group or any member is in jeopardy; for example where retreat or diversion is necessary due to illness or bad weather. The minimum group size we need to run this expedition is three clients. The maximum size of the expedition will be four customers plus leader. Our price is for leadership/guiding and mountain services only. It INCLUDES the leaders fee (wages) and all their expenses, such as flights, travel, hotels, meals, permits. It also INCLUDES his or her share of communal expenses, which may be such things as 4x4 rentals, diesel and fuel, mule or porter costs. Our price also INCLUDES all mountain services such as provision of tents, stoves and all other communal camping equipment, all mountain food including all camp food and lunches on day trips. It also INCLUDES any communal mountaineering equipment that may be necessary, such as ropes and on most expeditions emergency use of satellite telephone link. Our price does NOT INCLUDE - your flights, your insurance, your hotel/hostel accommodation, your meals taken at cafes and restaurants, your share of communal travel costs (e.g. 4x4 rental, mule costs), your personal climbing and camping equipment (i.e. used by you alone, such as sleeping bag, ice-axe, crampons), permits or peak fees payable by yourself. 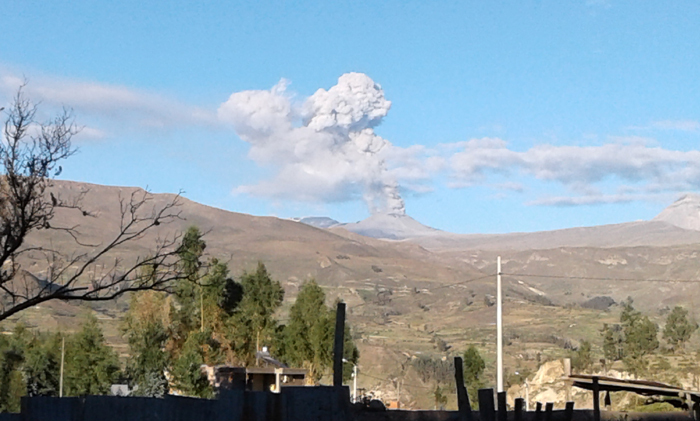 Volcan Sabancaya, 5976m, erupting in 2017, as seen from our hotel in Yanque near Chivay. This is an adventurous itinerary and all clients will be exposed to an element of risk by taking part in this itinerary. While we take all reasonable precautions to reduce risk it is neither possible nor desirable to completely eliminate these additional risks. Some of these hazards carry the risk of serious injury or death. It is important that you understand the risks involved before signing our booking form. We have identified the following areas as the principal additional risks of this itinerary. This is not a fully inclusive list - please ask if you would like to see a more detailed risk assessment of this itinerary before booking. Crime : Peru has a higher crime rate than Europe. As a wealthy tourist you may attract attention. Driving, hotels and general safety : In Peru driving, health, fire safety standards and general safety standards are not as high as in Europe. Earthquake : This part of Peru is in an area of high earthquake hazard. Remoteness : You will be several hours, or even a day, away from professional medical help for much of the time. There is no chance of a helicopter rescue. Weather : These mountains are only very occasionally affected by bad weather. Mountain Hazards : In certain places you may be subjected to a risk of rockfall.